Our knowledge of the aether, its intrinsic connection to consciousness, its background structure as a fluid-like energy substance and its ability to be harnessed with technology is certainly expanding as we proceed. What we will begin to see in this chapter is how our three main components of vibration – light, sound and geometry – emerge as the unifying forces at work in the structure of the aether. The geometry we will deal with in this chapter is that of the sphere, as its presence is most fundamental to all future chapters, and we will focus on the connection between aetheric energy, spherical geometry and light. In this excerpt from Thomas’ book Anti-Gravity: The Dream Made Reality, the work of obscure Austrian physicist Karl Schappeller (d.1947) is cited to explain the unusual effects associated with the Searl Levity Disc, and to provide a tangible explanation for how it might function. As we indicated before, one of the most bizarre effects that was produced by the Levity Disc was a pink to blue glow that would be seen around the craft while it was flying in air. This is called "ionization," and it occurs naturally when gas molecules get charged up with enough electromagnetic energy that they start emitting photons; emitting light. Since the Searl Effect is caused by nothing more than powerful rotating magnets, this bizarre visual effect makes us ask some deeper questions as to the nature of magnetism itself. Why indeed can certain forms of high-energy magnetism be seen to glow, and does this glowing have anything to do with the reason for why the Levity Disc defeats gravity whereas other devices have not? Schappeller’s work, which provided inspiration for Professor Searl in the first place, appears to have the answer. Primary magnetism [causes] a gathering of the surrounding [aetheric] space fabric and from [that fabric,] it [releases] more fundamental energy as an intensification of the primary magnetism. When the [density of the energy gathered by the magnetic force in an area of so-called "empty space"] [reaches] a required level, matter [will be] produced. The system would take up a spherical form in the "natural" state and become what Schappeller called "glowing magnetism…"
The existence of "ball lightning" has now been accepted but as yet [it has] eluded explanation, except that attempts have been made without the usual mathematical substantiation. The peculiar anti-gravitational [effects created by ball lightning,] the inductive effects [where the lightning is seen to draw in energy from around itself] and the fantastic energy of ball lightning fits neatly in with Schappeller’s theory of glowing magnetism. Ball lightning can be created when two strokes of lightning collide. Typically one stroke travels from cloud to ground and the other stroke travels from ground to cloud. When they meet, if polarized correctly, some of the energy can wrap around itself in a semi-harmonic pattern… Sometimes the two strokes are so highly polarized and have such highly matching wave patterns that more than one ball will be created. A string of balls is created. This is the so-called "bead lightning…" Sometimes, cloud-to-cloud lightning will create ball lightning that is visible from the ground or from planes. Ball lightning seems to come in certain sizes. One common size is about the size of a basketball. The limit to the size is based upon the energy in the strokes that create them. As a more personal example of ball lightning, this author’s own father (Wilcock) witnessed it while lying ill in his parents’ lakeside cottage in the Adirondack Mountains of New York State, an area which often had very intense lightning storms. With explosive sound, brightness and power, a four-inch wide ball of light entered the house through an electric outlet and burned a long, straight line into the carpet as it traveled, exiting with an explosion at the outlet on the opposite wall. Some fire and damage were sustained but he remained unharmed. So, with Dr. Nordberg’s data on ball lightning, we can better understand the implications of Schappeller’s research, which created the intellectual foundation for the successful prototype of Dr. Searl’s anti-gravitational Levity Disc. Here, we can see that the spherical shape is the “natural state” where the aether flows into our world and reaches balance. It seems that in the case of ball lightning, we have an opportunity for energy to reach this perfect balance naturally, and sustain its existence for a short time. With Schappeller’s work, this could actually be reproduced in the laboratory, as Dr. Searl later also replicated. The one key point that we should see here is that when aetheric forces bleed through and reach a point of balance in our own real space, they are visible as light that naturally assumes a spherical shape similar to a soap bubble, in varying sizes. We have already demonstrated various pieces of evidence, such as the Aspden effect, that suggest that the aether behaves like a fluid in vibration. Remember that either light waves or sound waves could travel through water, and you would still be able to detect them; the water would simply be the medium through which they were traveling. Similarly, it would now appear that light is also the traveling of an impulse of energy through the fluidlike aether medium. We have already suggested that the only thing that “truly” exists is the aether medium itself; light and sound and geometry, as well as other forces such as electromagnetism and heat, are simply different frequencies that vibration takes on as it travels through the medium. That point cannot be underestimated; nothing else truly “exists” besides the aetheric medium itself. Light and Love are interchangeable terms; both represent a vibration of the aetheric energy that is in greater unity with Oneness. Schappeller and Nordberg both suggest that the sphere is the natural “balance point” for magnetic / aetheric energy, and it is then visible as light. And as we suggested earlier, the simple geometric definition of a sphere is that it is the ultimate unification and balance point for any vibrations. As anyone can see from the films of astronauts in the Space Shuttle, liquids in zero-gravity or free-fall will naturally form into spherical blobs as they float; this is as a result of the equal air pressure pushing on them from all directions. The sphere is the shape of perfect equilibrium that will occur in a fluid when internal and external pressures reach a point of exact balance. Therefore, since the aether appears to have fluidlike properties as well, we could also see the sphere as representing the ultimate equilibrium, the highest vibration, the purest Unity that there could ever be. Light and Love and the Sphere are all interchangeable definitions of aetheric energy that is in unity with Oneness. Remember that Light maintains the highest frequency of vibration of all the various energetic fields that we have discussed, in the same sense as the sphere represents this geometrically. Therefore, it should come as no surprise that many different spiritual traditions focus exclusively on Light and Love as being the primary identity of God. In the more esoteric traditions, such as the Pythagorean and Platonic mystery schools and many Eastern teachings as well, the sphere was also associated with God, though often concealed in two-dimensional images of a circle, or especially a circle with a dot in the middle, which also could refer to the Sun. What we are truly seeing is a visual representation of the highest and most refined vibrations within a fluidlike aetheric medium, which we suggest forms the body of the Ultimate Being. This is a very significant point, as both Dr. Nordberg’s theory and Schappeller’s "glowing magnetism" concepts suggest that this mysterious, conscious aether energy / Oneness that we call God is pure Light. For the modern mainstream scientist, this is often seen simply as a fanciful metaphysical belief that does not have any relation to “true reality.” Light is seen as a photon, which is just one of a variety of "particles," even though the particles have a peculiar tendency to show up just as easily as waves, depending on how you measure them! But with our new information, even though the aether behaves like a fluid whereas light does not seem to have any immediate fluidlike properties, it should nevertheless be easy for us to conclude that the terms aether and Light could be interchangeable. Spherical, loving light is the primary definition of aether, since it is the highest form of its vibration; it is the true nature of the Ultimate Being. From the scientific perspective, we can see that the connection between aether and Light must be possible from Einstein’s work with relativity, where energy and mass were directly and mathematically interwoven with the speed of light. As everyone knows, in an atomic explosion, a tremendous amount of blinding white light is released; light so powerful that it can incinerate anything in its path. It is this very "flash point" that reveals to us that matter, which is formed from the aether, is nothing more than a highly-compressed form of light. And so, many theorists such as Nordberg and various contributors to KeelyNet and the Institute for New Energy believe that in the aether and in physical matter as well, light is in a condensed form that can later be released. In fact, the aether is the condensed form of all vibrations, whether light, sound, heat or otherwise. Basically, [the device] consists of a pair of coils wound on to a hollow ceramic [sphere,] contained [inside another] sphere [of] iron. The coils are of copper tubing packed with a permanent electret material... [Electret material is capable of storing an electromagnetic charge, so with the copper coils Schappeller created a sphere that can focus electromagnetic energy.] This constitutes the dynomagnetic generator. Because of the terminology in the Schappeller theory, it is naturally difficult to follow, that is, apart from the strangeness of the concepts. After several readings, one might conclude that "glowing magnetism" or aether precipitation, starts if the electric and / or magnetic fields reach enormous values at a given point. It seems that this is the function of the stator device outlined above. Later in this same article, Thomas relates this finding of Schappeller’s to the behavior of the Searl Levity Disc, since a clear "glowing magnetism" ionization effect was seen around the disc when it was traveling. And we remember that ionization is the charging of gas molecules with enough energy that they start to release photons. Therefore, Searl took the initial idea of Schappeller’s invention and transformed it into a design that could be transformed into an anti-gravity craft. Russian scientists Dr. Alexey Dmitriev, V.L. Dyatlov and A.V. Tetenov published an article with the intimidating title “Planetophysical Function of Vacuum Domains” in English on the Millennium Group website, which goes into far more detail regarding “balls of light” than we may have otherwise expected. Ball lightning is only one of a number of natural phenomena, which Dmitriev et al. refer to as “vacuum domains” or “VDs.” This term seems to be rather uncomfortable for some people, as we often think of the word “domain” as meaning “an area that a person (such as a king) rules over.” And the letters VD don’t sit well in the English language, for obvious reasons. In this model, the word “domain” is used more generally, as “a given area with clear boundaries, where certain rules apply.” And we remember that the word “vacuum” is often used interchangeably with “aether,” as aether is “the energy that will always exist in a vacuum.” So, to put it simply, a “vacuum domain” is an area with clear boundaries where the aether is directly bleeding through to our physical reality and creating a measurable energy change. Ball lightning would obviously be one example of a “vacuum domain” in action. The true value of Dmitriev et al.’s paper is that many more natural phenomena are identified besides ball lightning; furthermore, we learn a lot more about how these phenomena behave, and a full range of mathematical equations are applied to help explain what is happening. For our purposes in this book we won’t cover the equations, but the properties and behavior of these “vacuum domains” will certainly be very interesting to us. Most importantly, say the authors, in a vacuum domain (VD) the forces of electromagnetism and gravity work directly together, whereas outside the VD they do not. By definition, the VDs can penetrate through any kind of matter, since they are composed of the very energy that matter is made of. The authors produce equations to demonstrate that gravity waves are automatically transformed into electromagnetic waves inside the VD, and these waves are then directly visible to us as light. In the aether theory, both gravity and magnetism are simply different forms of aether in movement, so it would make sense that if you can create a large enough degree of movement of aether in a small area, then you would see the fields working together. According to Dmitriev et al., these VDs emerge all throughout the Earth, whether in the magnetic field, the layers of the atmosphere or within the Earth itself. Since the VDs can be quite large and can command the force of gravity, they are capable of having incredible power. A tornado is one such example of a VD in action, say the authors. These powerful areas of energetic force can also produce “enormous torsion stress” in the Earth that in turn affects the so-called “plate tectonics” of the continents and the seismic activity throughout the Earth. They create sudden, anomalous changes in the Earth’s magnetic field in localized areas as well. 1. Ball lightning. According to the authors, this is the most well known and studied anomalous phenomenon, and it displays all nine VD properties. Most scientific papers do not mention any effects of levitation occurring with ball lightning, but this is simply because the ball lightning is so small that it would be hard to see. The typical formation of ball lightning will be between 10 and 30 centimeters in diameter. Some have reported seeing dust particles rotating inside of ball lightning. 2. Natural self-luminous objects or “plasmoids.” Here we have objects that may be seen with the naked eye as bright balls of light, and may show up even better on film if they are photographed. They usually appear near the areas of the Earth where there is the most energetic activity, in the form of earthquake-producing faults in the crust. They have similar properties as ball lightning, and in this case the large-scale effect of levitation is more likely to be seen. The authors refer us to a case in Russia known as the “Sasovo explosions,” described by A. Yu. Olhovatov, where these formations were witnessed as being capable of levitating objects as well as producing the explosive effects mentioned in property number 7 in the above list. The images in the study show these clearly. 3. Poltergeists. While some cases of “haunting” may involve real entities in a nonphysical form, others appear to be cases where a VD penetrates through the walls of a person’s home. In these cases, a ball-like, slightly glowing energy is seen that can levitate objects, create electric and magnetic fields and also cause damage to people. If the phenomenon is seen to occur repeatedly, it might be because the house is built over an area of the Earth that is more energetically active and thereby capable of producing these formations. In 1951 in Texas a funnel passed over an observer at a height of 6 meters, the interior having a diameter of about 130 meters with walls of 3 meters’ width. Inside the hollow there was a brilliant cloud. There was no vacuum inside, because it was easy to breathe. In other cases, “swarms of ball lightning” and other luminous phenomena including “continuous glowing light” and “continuous lightning” are seen in and around tornadoes. Other anomalous phenomena involving gravity and the interpenetration of matter will be discussed in later sections of this book. The idea of an “air suction” to explain the levitation effects with a tornado is not sufficient, especially if a person can breathe inside. 5. “Angels.” This term refers to a special kind of radar interference that all systems must contend with. In the early days of radar, there were cases where blips appeared on the screen that appeared to be airplanes or missiles. The engineers realized that these were not actually physical objects and referred to them as “angels,” and now radars are built so that they will not mistakenly detect these formations. The authors suggest that “angels” are the same as “natural self-luminous formations,” as they both occur directly over tectonic faults. In the case of NSLFs, they are detected just above the faults, whereas “angels” are typically detected some kilometers above the faults. 6. “Small Comets” or “Atmospheric Holes.” These were seen on ultraviolet images of the Earth taken at high altitudes. About 20 times a minute, large black holes are seen to form in the upper ionosphere, each of which is approximately 30 miles wide. The conventional hypothesis, put forth by those who discovered this, is that these holes are being produced by “small comets” of snow and ice. However, if this many comets were constantly hitting the Earth, they should be also colliding with the Moon as well, but there are no tremors on the Moon’s surface to correspond with such events. Therefore, the authors consider that these may be vacuum domains as well. 7. Ionospheric and atmospheric explosions. In this case, the name is self-explanatory. Many people have heard spontaneous loud explosions with no apparent source, and without any signs of inclement weather. These explosions are associated with luminescent forms of spherical geometry that have also been seen to penetrate matter. 9. “Sprites”, elves and jets. These anomalies have only been recently discovered, and conventional explanations for them are still fairly weak. Above thunderstorm clouds, brief and very large flashes of light can appear up to 100 kilometers in height. They often appear blue or red depending on their height. Most importantly for Dmitriev et al., these formations are often associated with the most intense groupings of lightning strikes that are moving from the clouds to the ground. This suggests that the contact of the lightning is somehow combining with energy in the Earth to cause these luminous flashes to form. 10. Luminescences associated with earthquakes and volcanic eruptions. According to Dmitriev et al., almost all earthquakes and volcanic eruptions are accompanied by the sighting of luminous formations. They may be seen before, after or during the events themselves, and therefore are very closely timed with the events. If we look back to number 6 on the list, “Small Comets” and “Atmospheric Holes,” we see that it appears that about 20 times a minute, the Earth’s ionosphere is reacting with something that is creating 30-mile wide black spots in the ultraviolet spectrum. Dr. Dmitriev et al. speculate that these reactions are caused by VDs that are moving through space. The main problem was that there was no proof that such VDs existed… until now. Early in the year 2000, a great deal of excitement was generated in the Internet UFO community over what appeared to be “UFOs” that were filmed on many NASA Shuttle missions. Millions watched a short video promo for a UFO documentary film entitled “Evidence 2001: The Case for NASA UFOs,” which featured the work of Mr. Martyn Stubbs. …Weird shapes are shown massing on the shuttle equipment while the astronauts talk openly with mission control about the spooky event. Dr Guido Nigro, Director of the Search for Extraterrestrial Intelligence, SETI, observatory was reportedly visibly shaken after viewing part of the footage. "I am very impressed," he said. "This time we are not talking about footage taken by someone with a home movie camera. Martyn’s breakthrough came when he watched a $100 million satellite cable snap taking the tether 12 miles into space during NASA’s Discovery missions. "From the moment it broke to the moment it’s many miles away a spherical phenomena follows and swarms round it, all going in different directions. "When the astronauts were asked how far away the tether was, they replied more than 80 miles." He claims the distance and the size of the sphere-like phenomena must be huge. NASA has officially guessed that the shards are ice specks, but Martyn scoffed: "I’ve never heard of a six-mile long ice crystal that’s spotted crystal clear 100 miles away and there are hundreds of different examples. "Once NASA said they were shooting stars or meteors, but we have documentation that shows that NASA didn’t have an answer. "When you see those pictures, the pictures of the shuttle today and the Mir space station, you see the same spherical phenomena." Martyn also describes how astronauts on the STS-80 shuttle mission could not open the door due because the phenomena was BLOCKING it. "The phenomena was all around the door, and they (the crew) were moving the door and trying to get it open. "A flight or two later, the astronauts were commenting right on the feed that something had come right through the door, that they were seeing these flashing colored lights. To make this discovery he painstakingly examined more than 500 eight-hour video tapes. He said: "I can’t tell you what is there, but I can tell you what shouldn’t be there. It’s not a matter of finding something, it’s more about collecting, studying and analyzing. Eventually the jigsaw puzzle will come together." So, we can see that these spherical phenomena follow all the same properties as Dmitriev et al.’s vacuum domains. First of all, let’s consider the experiment that was conducted on Shuttle mission STS-75. In this case, a satellite was extended away from the Shuttle on a 12-mile long tether. According to an article by The Enterprise Mission and others, the true, hidden purpose of this experiment was to attempt to harness “hyperdimensional” or aetheric energy from the vacuum. In this case, the experiment was so successful that it actually melted the super-strong tether completely, which was obviously not expected, and caused the satellite to glow with ionizing radiation as it drifted away from the Shuttle! When we combine Stubbs’ observations with this, we can see that because of its sudden high electromagnetic charge, the satellite then attracted many VDs to itself that had been freely drifting in space and transferred energy to them, making them easily visible and possibly expanding their physical size as well. The resulting effect, seen by millions on the Internet when the movie was first released, is quite remarkable. The two above images are both of the same striking formation that was captured on the videotape of this event, slightly delayed in time from one to the next. The obvious black hole in the middle of this formation could be where the rotational axis of the VD is flowing through, and we’ll be discussing this central axis further ahead. When we look to the image on the right, we see the ring formation on the left image spreading out into a spiral shape, which is exactly what we would expect from the energy of a VD, flowing out from, say, the northern pole in a spiraling, rotating fashion as it makes its way to the southern pole. The notch at the lower left is at the opposite end of the object’s direction of travel, and may be formed by the VD’s outer field being disturbed by the dust and plasma in space as it moves along, creating a windsock effect over its entire surface except for in the middle, where the greater strength of its axis holds in more material. 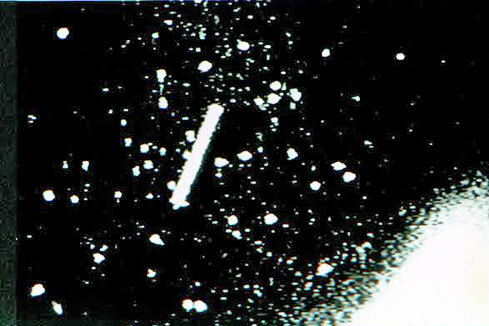 Another clue that these are energetic formations is that they were repeatedly seen to have a luminous “wobble” to them, and they drift relatively slowly, without exhibit the speed and abrupt, angular changes in movement typical of most UFO sightings. This certainly does not rule out the possibility that what we are seeing is indeed some form of extraterrestrial spacecraft. In the case of STS-80, a VD penetrated the Space Shuttle door, and its gravitational effects stopped the door from being able to open. At the same time, its natural luminosity was emerging through the door as well. Obviously this fits all the characteristics that we would expect of a VD, including the ability to penetrate matter, gravitational effects and luminosity. Furthermore, it could be that the VD was attracted to the door because it was the only area on the outside of the Shuttle that had a direct passage to the inside of the Shuttle, where there could well have been a greater amount of static electric charge that it was attracted to. This mission’s video data also produced images of luminous formations with the characteristic black dot in their centers. A series of images from Stubbs’ NASA UFO footage are collected at Jeff Rense’s website and can be perused for further study: http://www.rense.com/nasaufo/nasaufo.htm. And by far, the next image, showing the “swarming” effect of a very large number of spherical VDs around the tethered satellite, is the most provocative. The other phenomena that Stubbs discusses in the videotape is a very fast streak of light that can only be detected by slowing down the film to one-frame-at-a-time speed. These streaks are most likely formed by spherical VDs as well, only in this case they are difficult to capture on film because they are moving much more quickly than the slow-drifting VDs that were more easily observed. All together, it would seem that these VDs, here referred to as “NASA UFOs,” are being created by the intense electromagnetic activity of the Sun. Once released, they then move out through the Solar System via the Solar Wind, which is a continuous stream of gas, dust and energy that the Sun gives off. When the Sun is more active, more of the VDs are created and therefore more of them interact with the Earth’s electromagnetic fields as well. This clearly explains why Dmitriev et al. noticed that the number of reports of natural self-luminous formations and other related phenomena are always seen to increase during times of high solar activity. The power of the “vacuum domain” or “glowing magnetism” can also have an effect on a star that has recently exploded, causing anomalous spherical formations to appear. Dr. Nordberg reminds us that if there is an explosion in the vacuum of space, conventional science would say that it should move outwards in all directions at the same time, forming one large cloud of gas that is roughly sphere-shaped. 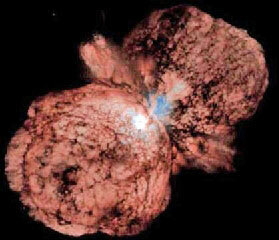 However, if we look at the exploding star Eta Carinae, we can see that it has formed two expanding spheres with a disc of light in between them. Current physics has no model of "spherical harmonics" that would account for any force that could hold together such a structure as this in the airless vacuum of space. Here we can see that similar to ball lightning and other VDs, the two sides of the explosion are being effected by spherical electromagnetic fields and thus holding their shape. If there were no aether pressure forming the two spherical shapes, then the explosion should have simply expanded straight outward from the center. There are common examples that can help us to visualize how energy flows over and through a torus like this. Many of us have seen those rubber tube toys that are made from balloons filled with water and that fold in on themselves, acting as another form of a torus shaped as a cylinder. When you try to squeeze the balloon in your hands it will immediately slip out, because it is actually a perfect closed loop – the entire outside folds through the entire inside. As soon as you try to grab it, the outer skin rolls into the inner portion, so that even if the part of the balloon skin that touches your hand doesn’t slip, the balloon still slides out of your grip. A smoke ring works the same way – it continues to spin around itself as it moves forward, so the outside and the inside are really the same surface in motion – the object only has one side, one surface, but it is still capable of having internal / external movement and circulation. Based on all available evidence that we will review as this book progresses, the toroidal structure must be included in the final design of the sphere or VD. This is what allows any VD to sustain itself, as the energy on the outside can continually flow through the inside and vice versa -- the flow is never interrupted. Most likely, the funnel cloud in a tornado represents the flow through the center of a very active spherical torus of energy, and the rest of the sphere is not visible. The tubelike center of the spherical torus forms its rotational axis, as we have said. This becomes an important point when we start looking at the spherical harmonics that show up in planetary energies, which we will see in later chapters. Indeed, the standard model of a planetary magnetic field shows a torus very clearly, with energy streaming out from the magnetic poles and forming a toroidal energy field around the planet itself. John [Searl’s] concepts are quite simple. What the rings and rollers represent is a cross-section of a complete system shaped like a sphere with a hole in the middle or a torus. The reason that the rings do not take the shape of a sphere is because the rollers, if they were curved, could not possibly revolve, hence limiting them to a flat-plane 3-tiered diameter across an imaginary sphere. [Note: As part of the design, each of the rollers revolves around its own axis at the same time that it revolves around the central rings.] The Searl system strips electrons off the atoms (ions) that are drawn into the center of the torus and accelerates them to the outer rim where they are picked up by coils as electricity. So, the true nature of what Searl had accomplished now comes into view. The rotating magnetic rings and rollers create the middle framework for a series of fields that actually form a vacuum domain or spherical torus. Obviously, as this is such a harmonic shape, it draws in a great deal of aetheric energy, thus significantly deflecting gravity enough to neutralize its mass. The spinning motion of the magnetic rollers causes measurable aetheric / electromagnetic energy to “spray” outward in exactly the same fashion as DePalma’s homopolar N-Machine that we discussed in previous chapters. Other interesting effects include the work of the converter in a dark room when corona discharges are observed around the converter’s rotor, which are seen as a blue-pink glowing luminescence with a characteristic ozone smell. The cloud of ionization covers the area of the stator and rotor and has an accordingly toroidal form. We noticed and measured an abnormal permanent magnetic field around the converter within a radius of 15 meters. Zones of an increased intensity of magnetic flux 0.05T located concentrically from the center of the installation were detected. The direction of the magnetic field vector [or flow] in these walls [of energy] coincided with the direction [that the rollers were traveling in.] The structure of these zones reminded [one of the] circles on water [that form] from a thrown stone. [Note: Obviously we know that these are spherical, toroidal zones.] Between these zones a portable magnetometer, which used the Hall’s sensor as a sensitive element, did not register any abnormal magnetic fields. An abnormal fall of temperature in direct affinity with the converter was also found. While the common temperature background in the laboratory was +22 degrees C (+- 2 degrees C) a fall of temperature equal to 6-8 degrees C was noticed [in the laboratory when the device ran.] The same phenomenon was observed in the vertical magnetic walls [of energy] as well. The measurements of temperature inside the magnetic walls were carried out with an ordinary alcohol thermometer with an inertia of indication of about 1.5 min. In the magnetic walls the temperature changes can be distinctly observed even by hand. The hand, when placed into this magnetic wall [of energy,] feels real cold at once. A similar picture was observed at the height above the installation, i.e. on the second floor of the laboratory as well, despite the ferro-concrete blocking of the ceiling. This report could not be studied scientifically by Roschin and Godin in their experiment. However, the Roschin-Godin study represents the first time that Searl’s results have been independently confirmed by an outside laboratory, thus dramatically increasing the reputability of his findings. Those who choose to be skeptical and dismiss these results are simply too stubborn to see the simple truth – anti-gravity and free energy is a reality, and with the arrival of the Internet and books like this one, it is only a matter of time before these technologies are widely known and implemented. And as we shall see as we go along, the spherical structure of the VD will be seen as the “missing link” to unify the Cosmos at every level, from the smallest quantum process to the macroscopic structure of the Universal Being itself. The VD is a reflection of the Ultimate Being in “physical” form. It is also the “shape” of our soul – our true energy bodies. In the next chapter, our discussion of spherical harmonics and energy processes will continue, as we bring in the work of John Keely. We will show more evidence of the importance of the sphere as the shape of “balance” in the aether, as well as the connections between the aether, the sphere and the vibrations of sound. We will also see how sound can be utilized to produce anti-gravity as well. 7.1 The work of Karl Schappeller provided the initial inspiration for Dr. Searl. He explained that strong magnetic fields can cause the aether vacuum to emerge as a visible form. The phenomenon of “ball lightning” shows this in action. 7.2 Light and Love and the Sphere are all interchangeable definitions of aetheric energy that is in unity with Oneness. 7.3 Schappeller was able to engineer a spherical ball of “glowing magnetism” in the laboratory with his dynomagnetic generator. 7.4 Dr. Dmitriev et al. labeled this spherical “glowing magnetism” as a “vacuum domain” or VD. Furthermore, his team used equations to show that gravity waves are automatically transformed into electromagnetic waves inside the VD, and these waves are then directly visible to us as light. 7.4.3 Mr. Martyn Stubbs’ rigorous documentation of “NASA UFOs” appears to be an observation of VDs in space. The spherical shape, central hole and spiraling energy emissions from the central hole are all clearly visible on film. This also gives us a method of understanding why our scientists have observed “atmospheric holes” occurring in the ultraviolet spectrum of our ionosphere appearing 20 times each second. The VDs are created in the Sun, travel through space on the “solar wind” and later strike the Earth, creating the holes. 7.5 The spherical fields of vacuum domains can be seen to form anomalous structures in space, such as the dumbbell shape of the nebulae Eta Carinae. 7.6 Charles Cagle demonstrated the idea that “particles” at the subatomic level are actually VDs as well, which he named “electromagnetotoroids.” From his understanding, workable free energy technologies have been devised. This brings us closer to a true “unified field” theory that shows how these VD formations exist at every level of size and complexity in the Universe. 7.7 The torus is a sphere with a hole in the middle, forming a donut shape. This is the true form of the VD, and explains the structure of the Earth’s magnetic field as well as the structure of the funnel cloud that makes the tornado. The “hole” in the sphere is what creates an axis that allows it to rotate. 7.8 Robert Grace reveals that what the rings and rollers represent in the Searl Effect Generator is a cross-section of a complete system shaped like a sphere with a hole in the middle or a torus. By creating this cross-section of the VD with rotating magnets, Searl was able to replicate the anti-gravitational effects of the VD and use them to levitate the craft itself. 7.9 Russian scientists Roschin and Godin were able to replicate Searl’s results. Though their device was not physically built to levitate, it clearly would have if they did not use mechanical brakes to stop it, as it went into a self-accelerating mode after crossing the critical threshold of 550 revolutions per minute. Most interestingly, when the device was powered a series of spherical energy zones were created around it, and “the structure of these zones reminded [one of the] circles on water [that form] from a thrown stone.” Within these zones, the magnetic fields increased and the temperature decreased. 7.10 Dr. Searl’s research associated the aetheric energy of the VD with an increased speed of healing. We suggest that the VD is actually the shape of the Ultimate Being, or God, as well as the shape of the soul as it is expressed in our different energy bodies.